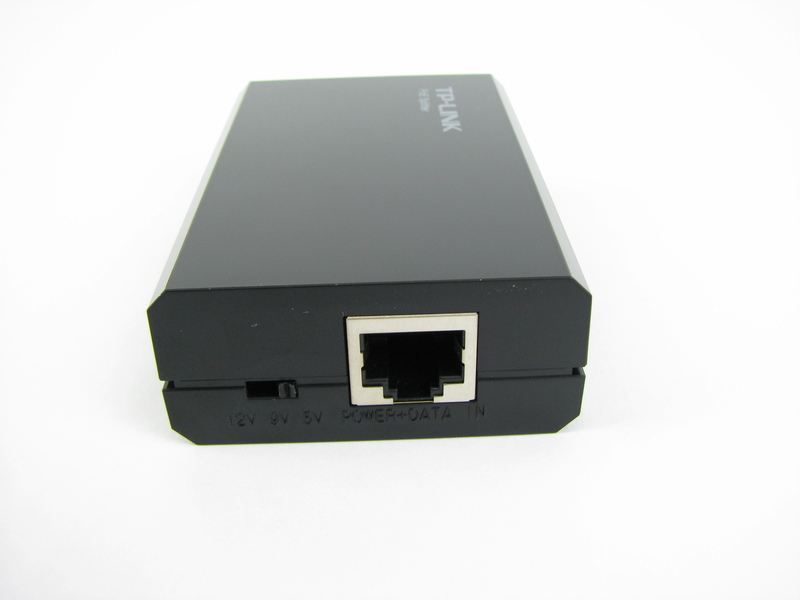 A PoE splitter is a small device that allows you to power non-PoE equipment from the standard 48 VDC of 802.11af PoE or 802.11at PoE+. The TP-Link Gigabit Ethernet PoE Splitter Adapter (TL-PoE10R) converts the PoE voltage to 5, 9, or 12 Volts DC, selected by a switch on the splitter. 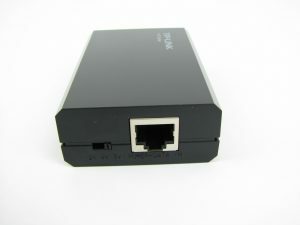 Simply put it at the end of a network cable connected to a PoE switch port or injector, and it can power your device instead of a power brick or wall wart. 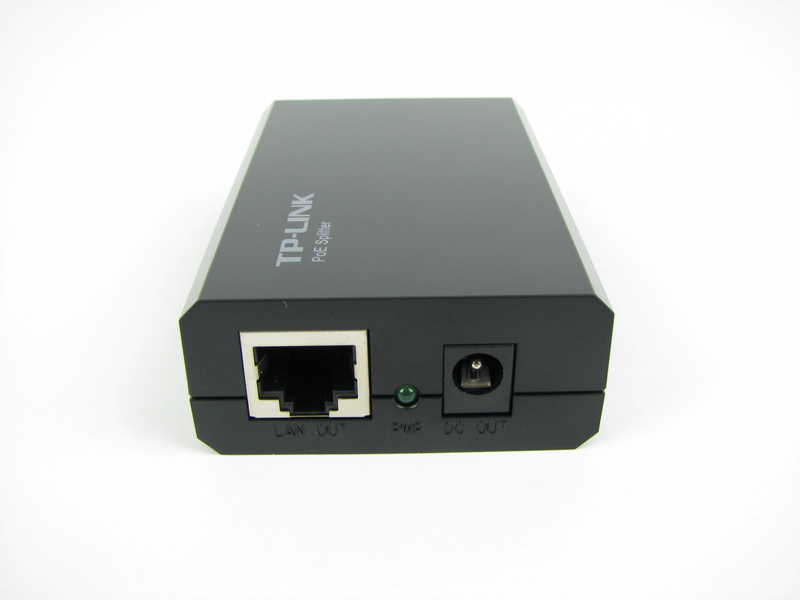 The input to the PoE splitter is just a network cable carrying Power over Ethernet. On the other side of the splitter is a 10/100/1000 Ethernet port with no PoE, and a 2.1 x 5.5 mm coaxial power port with the center pin positive. There is also a switch on the unit to select 5, 9, or 12 Volts DC output. Inside the unit is a small DC to DC converter that changes the 48 Volts PoE to the selected voltage. The 2.1 x 5.5 mm connector is pretty standard for many devices that use 12 Volts such as security cameras and IR illuminators and the splitter comes with a short male to male cable that you can use to power your device. If you want to power a device with a different connector you’ll need to come up with an adapter or a different cable. The splitter itself comes protected by plastic film and a foam bag, with no real chance of it becoming damaged during shipment or storage. Once the film is removed from the unit I did find that the smooth and shiny plastic housing of the splitter instantly began to collect fingerprints and dust. These pictures are from right after I unboxed it and I was unable to keep the unit 100% clean once I had it out of the box. 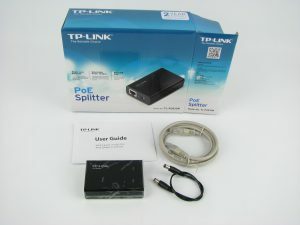 The User’s Guide recommends that the power being drawn from the splitter be kept to less than 10 Watts. This pretty much agrees with the specs given on the back of the unit too. Here are rated maximum current values given on the unit, multiplied to give the power in Watts. The most I drew from the unit was around 700 mA at 12 Volts, or 8.4 Watts. The splitter barely got warm to the touch when drawing 7 Watts continuously day after day. I tested 5 Volts with a D-Link DGS-108 mini-switch and the splitter powered the switch connected at Gigabit speeds with no issues. I didn’t test any device at 9 Volts because I don’t currently have anything that needs that, and certainly not with a 2.1 mm connector. I did most of my testing at 12 Volts, using a Reolink RLC-411WS camera, a Univivi U06R IR Illuminator, and an old Linksys WRT-54G router. All 4 devices that I tested used the 2.1 x 5.5 mm power connector. Voltage regulation is certainly good enough for powering any devices that I can think of. Voltage out never dipped below 11.95 Volts with the 8 Watts load, so it looks like regulation from no load to full load is within 2% at 12 Volts. I did a couple rough efficiency calculations based on power in and power out at 12 Volts and found it to be 70% efficient with a 3.2 Watt load and 83% efficient with a 7.8 Watt load. I don’t think you could really ask for anything better from an inexpensive device like this. 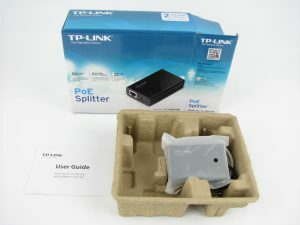 The TP-Link Gigabit Ethernet PoE Splitter Adapter (TL-PoE10R) is inexpensive and does exactly what it’s supposed to do. Simply connect it at the end of a network cable with PoE, and use it to provide a network connection and power to your device that can’t use PoE power directly by itself.